Every wondered why I write what I write? Here’s a blog post I wrote for Fresh Fiction. It’s really short. Have a great Thursday, as we begin the countdown to the weekend, Peeps! I have always thought of science fiction and fantasy as the Out-of-the Box genres. They stretch the mind, coaxing it out of the mundane and into the extraordinary. Especially science fiction because there are no magic bullets to get characters out of a fix. No rings to rule them all. But, they’ve got really cool gizmos and gadgets and awesome ways to get from point A to point B. Think Star Wars. Add some romance to the mix, and well, you’ve got it all. Again, think Star Wars. Think Princess Leia and Han Solo. Without that added nuance, you’ve got a great tale with all the elements Joseph Campbell pointed out in his Hero With A Thousand Faces. But the romance makes it touching. Makes it human. Provides the warm fuzzies many of us (including myself) want and need to make the experience complete. That’s what I like to write and to read: science fiction adventures and love stories that sprinkle in some fantasy (just can’t help myself.) I like to take my characters and put them in situations where the reader can enjoy the read (my primary goal) but also can explore contemporary issues in an out-of-the- box format. It’s a non-threatening way to get the reader’s mind to problem solve. Take my book THE PEACEKEEPER CORP. That book is way out there and not for everyone’s taste, but its underlying question is how much guidance does one give a third-world-type population in order to nudge it into a so-called better lifestyle? It’s not an in-your-face exploration. I hate those. It really doesn’t even answer that question. But it does explore it. I’ve just launched a new series that looks at over-population, planet’s resources and the need to protect Mother Earth. The fantasy touch with this series is that all of the planets are sentient beings. But talk with our modern-day druids of Earth, our shamans or aboriginal tribes, and they would tell you our Earth, our home, is sentient. So, is my fantasy touch actually fantasy? See what I mean? Out-of-the-box. Readers, what out-of-the-box themes do you like to read in science fiction? Leave a comment below and be entered for a chance to win a digital copy of About CHAMPION OF ENTEAN! C.B. 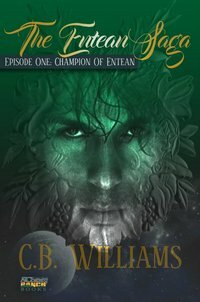 Williams is the author of several fantasy romance books that span the subgenres of Young Adult, Space Opera, Science Fiction and Romance. While each story is a grand adventure into time and dimension, her stories are also reflections of contemporary issues such as social norms, relationships, spirituality and environmentalism. She writes with keen emotional depth, insightful observations on human nature, and a fabulously quirky sense of humor. C.B. expresses her creativity across a variety of mediums, including painting, blogging and vlogging. She enjoys candid and open interactions with fans, readers and other authors, and shares her talent and knowledge of the craft through her role as The Manuscript Midwife. C.B. recently moved to Washington State, in the shadow of Mt. Rainier with her husband, three dogs, four cats and the wild things that share their space with her. When she’s not writing, you can find her painting, adventuring, blogging or coaching other writers as the Manuscript Midwife. Visit her online at www.cbwilliams.us. Eloch and Wren-strangers from different corners of the universe brought together by happenstance. When their paths cross, it will change each of their missions to serve and protect, as well as the course of their very lives.